I cannot find the Certificate of Analysis I am looking for. Help! If you cannot find the Certificate of Analysis you are looking for, please Contact Us. Where can I find the catalog number, SKU number, or product number? 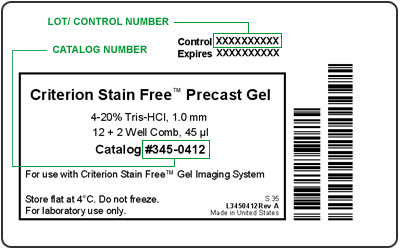 The catalog number, SKU number, or product number is printed on your product label. See the sample label below for the location of this information. Where can I find the lot or control number? The lot number or control number (one or the other, not both) is printed on your product label. See the sample label below for the location of this information. Why are Certificates of Analysis not on the Documents tab? Certificates of Analysis are associated not only with a product, but also with a specific lot of that product. For a given product, there may be several Certificates of Analysis, especially if it is an older product line and has had several lots produced over the years. Using the Certificate of Analysis search tool, you can enter the catalog number and lot/control number for the specific product you have on hand and download the exact Certificate of Analysis you need. I have a batch number, not a lot/control number. How do I find the Certificate of Analysis for my item? You can use the batch number in place of the lot/control number. Use the Certificate of Analysis search tool, entering the catalog number as usual and the batch number where the lot/control number would go. Can I get a Certificate of Analysis even if my item is expired? Yes. While we do periodically remove Certificates of Analysis for site maintenance purposes, we typically keep them available well beyond a product's expiration date. Why does it say "Product Name Not Found" for a Certificate of Analysis listed in the search results? There are Certificates of Analysis that correspond to products that are either discontinued or simply not available on the website. In these situations, the Certificate of Analysis is available for download, but other product details, such as the product name, are not. Why does it say "Not Available" for a Certificate of Analysis listed in the search results? In this case, you have entered a valid catalog number and lot/control number and we have located the Certificate of Analysis. However, for some reason, the actual file itself is unavailable. Please use the Request Form here or contact your local Bio-Rad Representative so that we can send you the Certificate of Analysis. service emails on our Contact Us page. Sign up and manage all your Bio-Rad business online with My Bio-Rad. Your partner in the life sciences and clinical diagnostics for more than 60 years.